Last week I completed the first sleeve of my cardigan. The bound-off edge felt a little tight, but I thought I could just block it a bit. So I went ahead and seamed the sleeve, closed up the small hole in the armpit and weaved in the end of my yarn. "Finished!" I thought, and moved on to the next sleeve. But I knew it was too tight. I tried it on, and it pulled at the sleeve of the shirt I was wearing under it. Maybe blocking would help, but you cannot hold out hope that blocking will solve all of your problems - believe me, I have tried it and been disappointed. I just finished the second sleeve, using this fabulous stretchy bind-off. It is a miracle! A nice stretchy edge without flaring or otherwise looking odd. (I used this bind-off for my black v-neck sweater and the flaring was fine for that sweater, but not appropriate for this one!) But this new bind-off doesn't at all alter the look of the finished edge, making it just perfect for this sweater. So. Now I must undo the bind-off for the first sleeve and redo it using this new miracle stretchy bind-off. Had I lazily left my weaving-in until the end it would have been much easier, but no - being Little Miss Knitting Overachiever, I try to weave in my ends as I go to make things easier on myself. Ha! Let this be a lesson to me. Now, you may be thinking that undoing the seam and woven in end is not a big deal, but it can be perilous indeed. 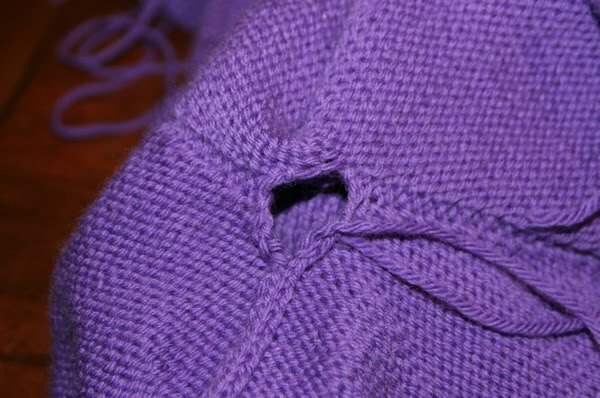 For instance, there is that time I had to undo a seam and after undoing my woven in end and continuing along, I realized that I was actually unraveling the piece of knitted fabric. The danger has passed and it should be a piece of cake from here on out. I have undone many a standard bind-off so I do not anticipate trouble there. Sure, this has set me back a little, but extra time is well worth it to fix something that may make the difference between wearing the sweater and not wearing sweater. Had I not taken the time to make this better I would surely regret it later! I'm glad you found a solution to the bind off issue and as annoying and fiddly as undoing the bind off was you will be forever happy that you made the effort!